A few years back dog sled racing came to the Boundary courtesy of the efforts of Dr. Ruth Sims and a host of volunteers. The 200 mile course following the old railway bed proved to be one of the toughest and the first years’ races were called because there was too much snow. After a rethink and missing a year the dog sled races are back in the Boundary. This time, instead of 200 miles to cover, they’re sprint races of just a few miles length. Which means they are shorter – you can see them take off and return in at the same event! 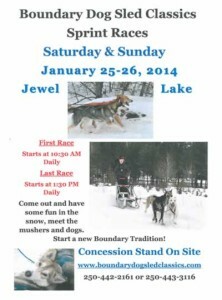 The races are this weekend at Jewel Lake. Both Saturday and Sunday. I talked with Dr. Sims and she tells me there’s at least 15 teams signed up. There is a concession stand on site. This entry was posted in Whats Up In GF and tagged dog sled, race on January 24, 2014 by gftvboss. The Boundary Dog Sled Association is having a fundraising event this coming Sunday, Aug 18, at Jewel Lake. They’re putting on a Relay Race and a BBQ. The Relay is 3 parts: Canoe, Bicycle and 3-legged race. This entry was posted in fundraiser, Whats Up In GF and tagged dog sled, fundraiser, Jewel Lake on August 14, 2013 by gftvboss.